Hockey Training on Unstable Surfaces? As the subtitle above completely gives away, this week I’ll be breaking down my personal opinions on unstable surface training and why I believe hockey players would be better spent using their off-ice gym time using other training methods. The measure of how effective any given program, periodization, exercise, loading parameter, technique, or training philosophy will be towards improving your hockey performance is best guided by how well, or how not well it encompasses the scientific principles of training. To measure a programs worth, you must first having a well-developed working understanding of the training principles, sports physiology, and the physiological breakdown of the sport in question. Specificity: The principle of specificity is both the most important principle in hockey training as well as one of the most scientifically straightforward. Technically speaking, specificity means that training should tax and stimulate the underlying systems of the sport task. That is, specific training trains the systems responsible for generating movement for that sport move in question. This can mean training the muscles involved in the movement, training the nervous system to improve in the direction it would be used in a movement, or even training the direct movement itself. For hockey, this means training all of the underlying systems involved in on ice hockey performance. Specificity as a principle can range from broad to narrow, meaning, training the strength and power systems will promote increases in hockey performance because strength is an advantageous quality to have on the ice but training the alactic system specifically is more specific to the primary energy system use on the ice where it matters for explosive starting speed and acceleration. Broad specificity can be described as training a general characteristic that could improve performance on the ice whereas narrowed specificity would be training a quality that is best suited to improve hockey performance in comparison to anything else. Example of a good use of training specificity: Improving relative strength levels in the lats and hand grip to improve shot power on the ice. Example of a poor use of specificity: Long distance, low intensity jogging to improve conditioning levels. 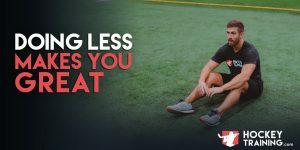 As I have talked about in the past, once an aerobic base has been reached this becomes a defeating technique and your time can be better spent improving your anaerobic power and capacity as opposed to your aerobic capacity. Overload: Overload is our next most important training principle after specificity, and is absolutely critical to even marginal success of a hockey training program. One of the oldest and most research-grounded training principles, overload has a well-established, two part definition. b.) The stimulus is on average greater than recent historical stimuli. To put it simply, presenting an overload is creating a more difficult workout through any method (exercise, rep, set, session, total volume, total intramuscular tension, % 1-Rep Max [1RM], etc.) in order to take the body out of homeostasis and force it to adapt and change. As an easy example of overload, if you had a 1RM of 400lbs in the squat and today you hit a 405lbs squat, you have created an overload stimulus for your body to adapt and positively respond to acquiring new strength levels. If you haven’t nailed down those two principles yet (the terminology can get very nit-picky and overwhelming sometimes on the first read, and that’s even with me trying to make it simpler than it is taught in textbooks) feel free to head back and go through it once more, it’s important to understand before moving on from here and your fundamental understanding of those principles will give you a solid advantage in viewing any future program design. This is a question I have asked myself since the beginning of the unstable surface training craze. How is this specific to hockey performance? When is anybody ever unstable on the ice enough to warrant further training? In hockey, any movement that occurs is only due to your movement. The ice remains stable throughout the entire duration of the game. Think about a defensemen, he will lock his skates down on the ice before he pushes a forward away to clear the net. He locked himself into a stable surface to generate power, not a wobbly one. Think about taking a slap shot, your feet are completely locked down throughout both the loading and exploding phase. We naturally drive power up from the stability our blades on the ice gives us, if the ice was a stability ball we would never be able to do this. Think about face-offs, you are completely locked into position no matter what position you’re in, ready to take off and explode in any direction. No measure of an unstable ground no matter how you look at it. At no point in hockey are you ever being challenged by an unstable surface, therefore we are already losing some points for training specificity here. It is not sport specific in any way to train on an unstable surface when the sport of hockey is played on a stable surface for the entire duration of a game. Hockey players need to be fast and they need to be explosive, I think we can all agree on that. So, how do we train to gain those qualities? Well, you train fast and you train explosive! Your training needs to represent what type of result you desire. But hold on a second here, anytime you step on an unstable surface both the eccentric and concentric portions of any lift have to slow down because your nervous system muscle fiber recruitment pattern is focusing on not just the lift, but the balance aspect of it as well. So no matter how experienced you become with the unstable surface equipment, you’re still going to be moving slower in comparison to a solid ground movement, creating a huge limitation in your explosive power training potential. This alone violates the law of specificity to a great degree; you don’t train slowly to move fast. This should be common sense. Slow eccentric and concentric movements = slow athletes. Why would we ever train slow to move fast? It’s comparable to shooting free throws in order to get a better slap shot. To properly train the muscle fiber recruitment utilized in fast explosive movement you have to train fast and explosive. Specific Adaptation to Imposed Demand (the SAID principle) has been around forever and people seem to forget this. Moving slowly in your training = moving slowly on the ice. You are training the wrong neurological recruitment patterns and trying to develop a system that isn’t going to improve your game. As I discussed in my hockey power blog post, velocity needs to be at a minimum 90% in order to maximally develop power — so right away we are training in a manner that doesn’t allow for power development and therefore doesn’t allow us to train for rapid force production. This rapid force production directly effects your skating starting speed, acceleration, shot power potential, shot power potential with limited wind up time, and overall agility. Huge factors to hockey performance, to say the least. We can train for strength though on this equipment, right? Being on an unstable surface, you sacrifice speed of movement due to the challenges of balance, but going hand-in-hand with the challenges of balance you also sacrifice how much weight you can use. Your added weight in the form of dumbbells or barbells on an unstable surface is a marginal fraction of what you could be using on solid ground. 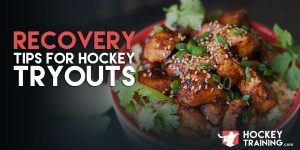 And when you’re sacrificing strength development you are sacrificing so many things related to hockey performance I couldn’t even go over it within this blog post. Who do you think is going to be the faster man who is harder to knock off the puck? The man who explosively squats 400lbs on stable ground? 10 times out of 10 the man squatting 400lbs on the ground is going to be faster, harder to knock off the puck and have a hell of a lot more power to express on the ice. Not to mention that added strength development will be paying huge dividends towards injury prevention as it will strengthen not just his muscles — but also his bones, tendons, and ligaments. What’s ironic in the sense of sports physiology is that we have completely violated specificity in terms of hockey development by sacrificing speed, strength and power development that can DIRECTLY improve performance and yet this equipment is often marketed as “functional”. How is this in any way, shape, or form functional or conducive to hockey performance? Functional training to me means observing the biomechanical, physiological and bioenergetic demands of the sport and segmentally working backwards in determining kinetic segments, muscle actions, intensities and energy systems required for each athletes position that you can effectively train off the ice. After all is said and done here, the last marketing angle unstable surface training can reach for is its effect on improving your balance. But like I eluded to earlier, when are you ever actually off balance on the ice? Maybe when you’re 5 years old and first learning to skate? The only time you are off balance on the ice is if somebody has knocked you off the puck. But you know what prevents this? Being strong enough to stop that from happening in the first place or being fast and explosive enough to not be there when it happens. How do we do this? Not training on an unstable surface! It defeats its own purpose. The barbell and dumbbells are the best tools you are ever going to find in a gym. How well you use those tools to improve your game is going to be dependent on your periodization and program design. Moving on from here, I think it’s safe to say that unstable surface training severely violates the principle of specificity. Which is a huge deal in my eyes as a strength and conditioning professional because that is the most important principle of them all especially in sports science. If the above wasn’t already enough, let’s get into overload. One of the most important principles to thoroughly understand if you want to start creating professional hockey strength and conditioning programs. We NEED to be presented with continuous overload overtime in order to disrupt homeostasis within the body and force it to adapt and recover with new found ability. An example of not presenting overload would be that your only leg work you ever do is squat 135lbs for 3×10 every single workout and wonder why your leg strength is never increasing. Well, you never programmed in an overload stimulus and as your body adapted to that stimulus it gained enough strength to handle it and didn’t need to gain any more strength because you weren’t presenting the body with a reason to. The body will only ever adapt to what you force it to. Which is a perfect segue into how unstable surfaces violate the principle of overload, you can’t use the same type of loads you can use in comparison to on-the-ground training. Any time an exercise becomes less stable, force production declines and proper overload can no longer be supplied. Thus, any training strategy that disrupts your ability to produce force on a stable surface becomes a highly ineffective tool to becoming a better athlete. Additionally, the kind of stability required under maximal loads is specific to maximal loads, so this type of unstable equipment will not help you maintain technique under heavy weights as they are sometimes advertised to do. Different recruitment patterns for different styles of lifting, you will find very little carryover from squatting on a BOSU ball to squatting on the ground. If strength and power training improves our shot power, improve all aspects of speed development (starting speed, explosiveness, agility, acceleration and top speed), makes us harder to knock off the puck, and can improve our sport specific conditioning to hockey — why are we taking weight off the bar so we can balance on a ball? We need that weight on the bar so we can improve our relative strength and power output so we can improve our performance on the ice. This is the meat and potatoes as to how unstable surfaces effect our ability to present an overload. You don’t ever see somebody squatting 400lbs on an unstable surface, why is this? Well, you drastically increase risk of injury (which is a whole other can of worms with this equipment I’m not even going to touch on today) and performing with that type of weight on that type of surface is incredibly difficult even for the strongest men on the planet. Yet, somebody who can squat 400lbs on stable surface would be the more powerful and stronger man, and that’s not even a very impressive squat. Much more overload could be presented from there to improve hockey performance but would be impossible to do so with unstable equipment. Is unstable surface training the worst thing in the world? But it is my job as a strength and conditioning professional to make sure I give you guys nothing but the most thought out, up to date training information and I just personally feel your time would be better spent doing other tasks. Everybody only has “X” amount of time to train per week so that time needs to be allotted to the types of training strategies that are going to benefit you most out there on the ice. It’s a cost vs. benefit scenario, I just feel it’s a waste of your time and you could be making better gains using that time somewhere more productive. On this cost vs. benefit note, we also have to consider that even though it is not very conducive to hockey performance, it will still create fatigue accumulation. Your fatigue accumulation and fatigue management needs to be focused only on things that are going to maximally improve performance. Why create fatigue for little payback? I want you getting a better return on your investment than this. Those types of people are the exception, not the rule. Additionally, just because somebody is a good player it doesn’t mean that they couldn’t be a better player had they trained with a better program. There is always room for improvement and unstable surface training has its obvious limitations. The “it worked for him” scenario doesn’t even matter. You know why? Because specificity works for EVERYBODY and overload works for EVERYBODY. So when you immediately violate these two principals, you’re doing yourself a massive disservice. Sure, everybody can pretend they are a special little snowflake and feel something “works for them” but at the end of the day, you’re still a snowflake buddy! A human body is a human body and nobody escapes the effectiveness of the foundational principles of program design. At the end of the day, a program’s main base of performance enhancement should never be built around unstable surface training; it should either play a (very) small role in what the year’s periodization looks like or be eliminated entirely. A good strength and conditioning system is a system that stays within the realm of the effective training principles and properly applies them to functionality in its true meaning. Thanks for checking out this blog post. Check out our Hockey Training Programs if you want access to our programs that will make you a faster, stronger, and better hockey player! When Can I Add More Hockey Training? Great article! As a beer leaguer, I always try to stay current on training methods and the most effective exercises. Your elaborate articles with great detail help educate us. Thanks for sharing!